I've been riding an Xcite ride 110 for the last 18 months and recently bought an Atomiq 120 AST to help improve my gybes, go from flare to planing etc. I've really enjoyed, as a butcher's pencil built bloke of 60kg, being able go out in any wind on the new board and uphaul my way home. Last weekend I went for a sail at Manly Qld and found that even though there was some wind, the board felt really hard to get on the plane. I've only used it in weak winds since I got it, but am really wondering if I've ended up with a board that is slower to plane in spite of its resemblance to SLW style boards. One of the crew said that he thought the Atomiqs are tough to get planing without a pump or two and bearing off, Pity, as my technique leaves a lot to be desired. Definitely left an Ah shucks moment. When I took a photo of the two, it added to my theory, the Xcite looks like it is designed to lift up, the Atomiq sits flatter. Would be very interested to hear your thoughts., which one planes easier. Whatever the outcome, I reckon the Atom will be a keeper, great for ToW and I reckon could come in for small weak waves like a windsup and an easy cruise out to the line up, and maybe plane when it's windy. Can I get this board to plane like the Xcite and if so, how? Have you got a nice big slalom fin or just the generic one that comes with the board? Upright, 40-44 cm, costs more than $100? Preferably about $200? For example vector volt2? Fins can make a huge difference. ^^ this is the extreme example, but a fin choice tending towards larger, more upright and more refined (expensive) would be the way to go. Answer is pilot error, and also way wrong size board for your size! I'm 30+% heavier than you and the board in the pic is 20lts less than yours , fin size 38cm/35/32 worked best. 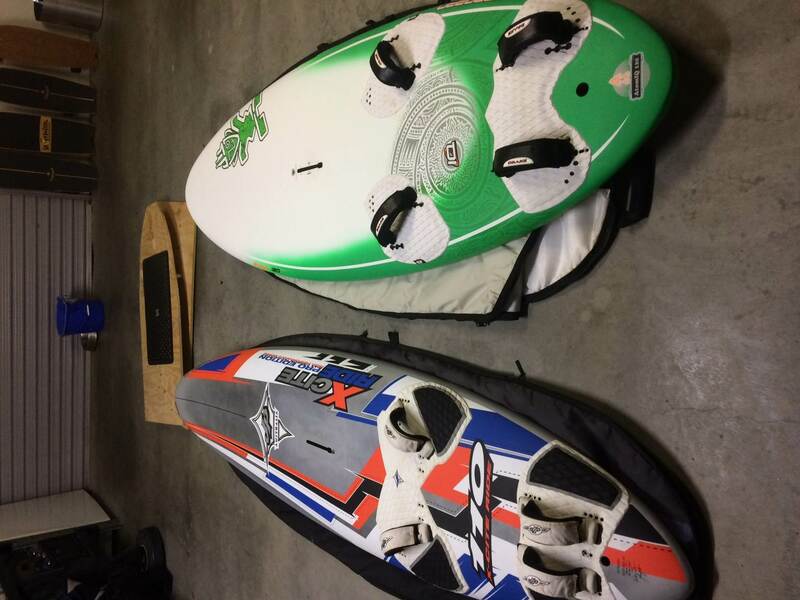 trade both boards in on the smaller model Atom, it doesn't require any different skills to ride, ignore the nose rocker in the xcite ride has nothing to do with your problem, the Atom has a slalom board rocker so it's quick to plane. Not as quick as a slalom board due to the reduced volume in the tail. I did ride a 'big' atom Once think it may have been 140/150? Was a pig, but in smaller sizes , one of the best boards and shapes ever, can't believe they dropped it! the standard fin is ok, bit subject to being overloaded and spin out, they did work better with a firm racier style fin, i'd Suggest the black project type R in it. As above, gotta step back with flatter, wide tailed boards. I have a 2016 Atomiq 114. I am a bit bigger than you, weighing 80 kg and standing 174 cm. I use the Atomiq with Ezzy Cheetah sails of 6.0 to 8.0, which is well within the range Starboard states (5.5 to 8.5). Prior to owning the Atomiq, I had an RRD Firemove 122. That board (the RRD 122 Firemove) planed VERY, VERY early. The Atomiq, on the other hand, if very hard to get planing. I am selling it the swap meet in two months. I wish I had kept the Firemove and not purchased the Atomiq. I have also owned at JP Magic Ride 104. So, I have experience with three of the short, wide, thin (top to bottom) free move boards. As i said, the Firemove was amazing. I could plane on it with a 7.5 in winds that would barely get me going on my Starboard Formula and 9.5. In fact, I got rid of the Formula and 9.5 because there was too much overlap in wind range between that set up and the Firemove 122, and the Firemove and 122 were a whole lot easier on the body. In contrast to the Firemove, the Atomiq seems too sticky (to the water). I can make it plane with a lot of effort, such as going deep off the wind, moving my weight back, and pumping my arse off. But it is not an easy or early planer like the Firemove was. The Magic Ride was about average in planing ability when compared to a conventional board. It was definitely not a super early planer. One thing I learned about this style of board (free move) is that the manufacturers overstate the maximum sail size. For example, the manufacturer says the Atomiq 114 will take an 8.5. It will, but the board won't plane any earlier than it will with a 7.5. The extra weight of a fully loaded sail (loaded with wind) pushes the thin (top to bottom) board down and makes planing more difficult. Similarly, the range on the Magic 104 was supposed to be 5.7 to 7.5, but 7.5 was too big for the board. It planed just as early with a 6.5. Finally, the range on the Firemove 122 was supposed to be 6.0 to 9.0. When I sailed it with my 8.5, my very large friend whom I use to gauge planing ability was planing much earlier than me. When I sailed it with a 7.5, I was planing much earlier than him. So try (as illogical as this sounds) a smaller sail and a bigger fin for early planing. As far as the small sail of the range, I fear I would get injured sailing the Atomiq with a 5.5 or the Firemove with a 6.0. JP was much more realistic when it said the Magic 104 could go out in 5.7 conditions. My Magic worked just fine with a 5.5 and at a stretch a 4.7. To sum up, move weight back, pump, and head off the wind. Try a smaller sail that does not push the board down into the water because the board is too thin top to bottom to handle your weight and the weight of a fully loaded sail. By the way, the Atomiq is a jibing machine once you get it planing. I was amazed at how well it jibes. I had already been scarred and suffering from ptsd after trying to get Morgs larger 160 atomic going at Weyba the same day that Jonesy gave it a go - still recovering from the blow to my self esteem! "Trainer board???" Not all beginner/intermediate boards are the same - per jiberjohn - especially the narrow tail "modern style". My recent poor experience on a large gecko vs success on fat tail boards and my mate trading a ghecko for a much more loved and successful futura reinforce this. If you have difficulty getting onto the plane you aren't 'in the hunt' to be practicing carve jibes. Sail the board that gives you the most planing time = excite ride? If the xcite is unstable in the uphaul = work on waterstarts. Time on the water is too short to be frustrated not planing when it's obvious that everybody else is. Hence find boards and sail sizes that make it easy to get the job done. Duncan in the same conditions last Sunday 70+kg was comfortably planing with 120l futura and 8.1m Severne turbo. Just a data point. Similarity my son 60kg was planing on Bic techno 293 with 7.8 race sail. Maybe you needed more horsepower? I've not ridden the Atomic, so I can't comment on its comparative planning ability. Thanks for the encouragement. I did wonder if a bit more horsepower would have done the trick but am sure that the tuning tweaks, and the techniques that have been outlined will make a big difference. interesting to read the more is less argument on wide thin boards, too much can slow things down. On this set up though, I reckon I could easily go 7.8, or just over 8m. While I recognise that the board is a bit of a bus for my size, I'm loathe to throw the baby out with the bathwater just yet. The board was funded by not drinking beer over God knows how long. I get thirsty just looking at it! I'm going to chase down that fin asap - even in the differing opinions in this thread, no one disagrees on the fin. I did spend time thinking about a Firemove - may get one yet, AFTER I've dealt with my Atomiq's pilot shortcomings. In spite of the frustrations, and the Ah Shucks, I'm hungry to get in the water and try the tips, may take both boards in the car to compare! I'll keep you posted. Im a heavy guy and always chasing the planing threshold . Im not sure if short wide boards are the answer. My 78 wide xcite ride planes far earlier than my 90 wide starboard go or my 85 wide starboard go ( 170 , 155 ) they are however faster. I believe a longer straighter outline ( rockers being equal ) is better for planing. The rounded outside shape of the shorter wider boards seem to grab the water. It makes for a fast stable board that can also turn but bogs through the water pre planing. Big fin , mast back ??? Out of interest what years are the starboard GOs.? Us sandstone mob love the older GOs for early planing - after my disappointment with a modern GO 2015 150 we recon starboard have messed up a good thing. Long story short, the suggestion was get a freemove board around 100 litres. It was time to plan my purchases. With my wife hooting with derision in the background about my forthcoming expensive five minute fad, I decided to save face and get set up for around a grand, and bought an Xcite ride from a mate, which I can waterstart fine, provided there's enough wind to lift the sail. In the back of my mind in all that time, I kept thinking 'if only I'd bought the freemove to help the gybes' '. I also liked the idea of a sup like board that I could use any time irrespective of the breeze, no more struggling when the wind drops too low to waterstart. Maximun ToW, which it does, if somewhat adhesively at present . Anyway, with all of this interest, you'll be pleased to hear, I am not resting on my laurels, Simon has made a sale today. My G10 slalom fin is in the mail. The older style starboards. They are good boards , quite fast and can handle rough water . But the older style Xcite ride 160 planes a lot earlier . But not the newer xcite ride plus 160 , they are harder to plane than the older ones . The newer xcite is shorter and about the same width and is fatter. It has less straight rocker and has about 5 mm rear rocker where the old one is flat. It did turn a little better , but that's not what a big early planing board is about. I didn't like the new one and sold it. Newer is not always better. I haven't ridden a new go. I made a board with the old xcite ride rocker and plan shape ( a little smaller all round ) and the concaves of the go and it's a ripper. Agree with Jibejohn regarding wide free moves and big sails - they can take them, but they don't benefit from them. I had a Tabou Rocket Wide 108 and used it with a 7.5 Turbo and 7.5 NCX. Both sails were too big for the board. I don't think I got going any earlier than with a 6.7. The Rocket felt too "thin" and not corky enough for the big sails. I think board thickness and weight matter just as much width for early planing. 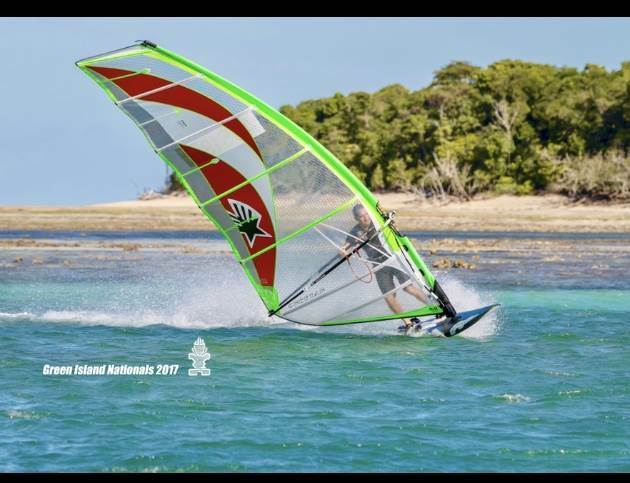 IOTW, get a slalom board. My slalom board of the same volume (measured vs Rocket's stated) gets going earlier and can take the big sails without issue. It is much lighter and only a bit narrower (69 vs 73), but a lot thicker throughout and especially in the tail. The thick tail actually makes it easier to get in the back strap than the Rocket Wide because it sits higher off the water and also lifts on the fin quicker. Also slalom boards entered into the PWA are actually measured. My 113L is actually 108L. You have no idea what the real volume of your free ride is. There is a thread on the Fanatic forum where one guy says his old 89L RRD planes up earlier than a new 105L Fanatic. The reply was: "... most of our tests on RRD boards have shown the volume is very often far, far higher than what is written on the board, similar to other brands - this gives the feeling that the board is planing earlier compared to the same volume from brands like ours where the cnc volume is easily calculated..."
For the OP - @60kg, he would get going earlier with a 100L slalom than the 120L Atom. Slalom boards have their downsides - not easy to gybe, and being so ridiculously light they are quite fragile. So I would not get one if still catapulting. I would have thoughy the excite ride was already perfect for your weight as your first board. You probably will never want a sail bigger than 6.5 or 7 too. Just keep pracising with the excite ride. The likelihood is that after another season you will be wanting a smaller board and you wont be thinking about large boards at all. This thin n wide stuff is a passing fad anyway. The advertised benefits just aren't there. This will be the last post on this thread before SB (rightly) close it down due to old age. I've heeded most of the wise counsel over the last few months, I've picked up a good 40cm fin, raised the boom, sget the footstraps forward and in, bought some more horsepower, an 8.0 Ezzy Cheetah, and for Father's Day have been given a 47.5cm Dragon Freeride which I tried out this morning. No planing problems for me anymore, particularly with the new fin. I was concerned that it would be over the top, but measured one foot off the tail and found it was smaller than the width measurement so gave it a go. What a great set up. The board feels like it wants to lift out of the water now. Loads of 'donk' to use a petrolhead term. In conclusion, I reckon that the Xcite carbon is easier to pump out of the water because of it's weight, but not sure it stays on the plane anymore than the Atomiq. I've really enjoyed the journey of refining the technique and actually being aware of what is going on and how I can tweak the way the kit performs. Thanks everyone again. You'll be seeing me out there, planing and stoked. Hungrywave over and out. Glad to see the Xcite stills gets some quality time! !